On May 9 1944, the Germans executed 6 Norwegians in Trandum woods near Grini prison. One of them, Major Arne Laudal was the leader of this group of prime Resistance members from southern Norway. In 1994Kristen Taraldsen wrote a book: Frihetens Flamme – major Laudal og hans menn (Freedom’s Flame – Major Laudal and his men), that tells the whole story of this important, but tragic Resistance group (Battle-Group 3). In addition to the six victims at Trandum, the book lists 318 names of men and women who were arrested in the so-called “Laudal case.” Many of them were sent to Germany never to return, others were imprisoned in Norway and others, after shorter or longer periods in detention, were released. For every one of these names we can calculate X-number of others; families, friends and colleagues, who were involved in one way or another. Amongst these was Tellefsen’s daughter, Magnhild, who was 6 when he was arrested and almost 8 when he died. She has nursed her childhood thoughts through 53 years while living in France and her recently written reminiscences can be found here. Taraldsen’s book tells a gripping tale of terror, torture, bravery, faith, hope, death and, for some, despair – suicide to avoid continued torture was not uncommon. Photographs show us the faces of the men, women, and children caught up in the dangerous game of Resistance. One photograph is missing: Torleif Tellefsen. He was one of the five other leaders shot with Laudal. This is his story. We have pieced it together from the pages of Taraldsen’s book, from Cato Guhnfeldt’s comprehensive and impressive Fornebu 9 April and from correspondence with Magnhild (Magnhild Tellefsen Toussaint), and her son Hughes. Torleif Tellefsen was born in Grimstad in 1902. He was artistic, an active outdoorsman, and technically gifted. From 1922 to 1925 he served in the United States Air Force as a mechanic, observer, and machine-gunner. 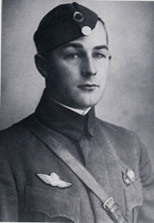 On his return to Norway he graduated as sergeant from the Army-Air School at Kjeller. After a stint at a shipping firm he rejoined the military when the war-clouds formed. On the morning of April 9 he found himself in the Fighter Wing at Fornebu. Airport. He was in charge of one of the machine-gun emplacements under the command of Captain Erling Munthe-Dahl. If the naval attack on Norway came as a surprise, an air attack on Fornebu was considered unthinkable. But at 0745 a message arrived saying that 8 fighter-bombers had been sighted over Moss and were heading for Oslo. By this time another flight of aircraft, carrying the parachute detachments, should have been circling Fornebu but they had turned back because of poor visibility. Their Messerschmitt fighter escorts however, had defied the weather and once over Fornebu they began to attack the ground defences. Sergeant Tellefsen and the few men in the machine-gun emplacements knew nothing of the drama that had taken place in the air: the bad weather, the aborted parachute drop, and the Norwegian Gladiator attacks on the invaders. They did know that the approaching aircraft had no good intentions. 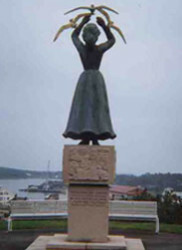 Captain Munthe-Dahl gave the order to fire. Tracer-bullets showed that some of the rounds hit home but they made no impression on the German aircraft. The return fire from the aircraft forced the men to take cover. By now the Junkers transport aircraft had arrived and under Messerschmitt protection the first one came in for landing. Tellefsen fired a long burst into the fuselage as the plane touched down but to his surprise the plane picked up speed and took off again. He thought the plane had crashed shortly afterwards but in fact it managed to land at Ålberg in Denmark. The leader of the transport group, Captain Wagner, and several others in the plane had been killed by Tellefsen’s machine-gun burst. At Fornebu, firing from the machine-gun emplacements continued – even after some of the transport planes had landed – but soon the ammunition ran out. Avoiding German guards and patrols, the men of the Fighter Wing then made their various ways out of the airport. They reassembled at Lysaker where reinforcements were expected. Captain Munthe-Dahl asked for volunteers for an attempt to collect some weapons and ammunition from a depot close to Fornebu. Lieutenant Røed, Lieutenant Wessel-Bergen, Sergeant Tellefsen, and a private volunteered and drove back towards the airport. When they reached the depot they found that the Germans were already in the area and shooting began. Wessel-Berg was wounded so they decided to return to Lysaker. The expected reinforcements had never arrived so from Lysaker the Fighter Wing marched to Akershus fortress in Oslo. The fortress soon came under air attack and during the chaos caused by the onslaught Tellefsen slipped away. He was arrested by a German patrol as he tried to make his way out of the city. Back in Akershus, now under German control, he was told he would be freed provided he promised not to take up arms against the Germans in the future. This he refused to do so he was locked up again. Later a higher ranking officer found no reason for detention Tellefsen was released. Back at home in Grimstad, Tellefsen quickly became involved with the Resistance movement. When Major Laudal started organizing Milorg in Southern Norway, Tellefsen became head of the Grimstad district. He rapidly built up an organization of 200 men .Almost everybody in Southern Norway believed that the British were preparing to invade Norway and drive out the Germans. Frequent landings and parachute drops of Norwegian agents along the South coast and in the mountainous hinterland fostered this faith in British intervention and encouraged men to join the Resistance. Some of them even quit their jobs to be completely ready to take up arms. For Major Laudal this enthusiasm was a two edged sword – building an organization was easy but came with an increased problem of security. Another security risk was the fact that, in 194l – 42, early days of the resistance, many Milorg members were also working for the secret intelligence organization, XU – an obvious security risk. Nevertheless, Major Laudal shared the optimism and built his organization on the premise that it would be ready to assist whenever and wherever landings should occur. In the summer of 1942 Major Laudal received an important directive, “General Instruction”, from SL (Central Command) in Oslo which gave detailed instructions about the structure, operation, and dispositions of the organization in preparation for the invasion and/or withdrawal of the German forces. He sent the directive to the heads of each section and his accompanying comments ended with the words “The Invasion is coming”. He retained this optimism even after his arrest and imprisonment at Grini in the spring of 1943. Not everybody shared this certainty of invasion. A few months earlier, on April 27, in Operation Cockerel, two Linge agents, corporal Tor Hugo van der Hagen and sergeant Erling Jensen parachuted into the mountains of East-Agder. Their mission was to give weapon, guerrilla-warfare, and sabotage training to future instructors in Major Laudal’s growing “army”. Jensen, alias “Arne Andersen”, was extremely sceptical to the invasion expectations – and both he and van der Hagen, alias “Peder Mjaaland”, disliked the contents of the directive. Others thought the directive too detailed – and a security risk. “Arne Andersen” started his training classes at Mosby, continued to Arendal and then to Grimstad to train a group of 5 men, one of whom was Torleif Tellefsen. The first part of the training took place at Tellefsens’s home and continued in the cellar beneath the Trio Tobacco Store in central Grimstad. The syllabus comprised instruction on Sten-guns, Mills hand grenades, home-made hand grenades, Molotov-cocktails, small arms and dynamite. Milorg had stashed away large supplies of Norwegian dynamite but this was different to the plastic explosive that Jensen was used to – so he had to improvise. 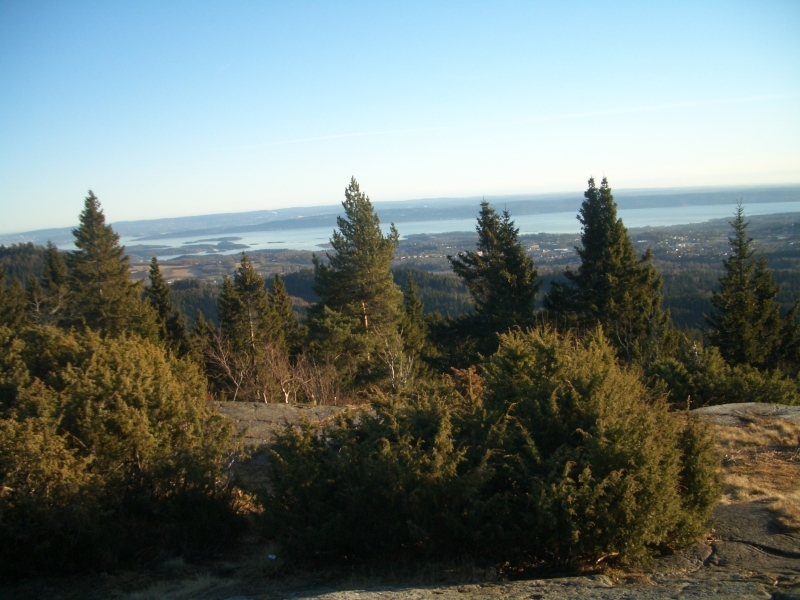 Early on in the training, Jensen commented on the poor security within the Milorg organization in Southern Norway. In addition to training, the main tasks for Battle-Group 3 and XU were co-ordinating supply drops and hiding the equipment, organizing transportation, and collecting information about German activities, troops, camps, and strong-points. Tellefsen, with his talent for sketching, was particularly adept at providing information about installations, camps, and strong-points. He provided the complete drawings for Marivoll Fortress, for example. On July 28 1942, German security police arrested Johan Ribe Tellefsen. This Tellefsen, (no relative), was the head of intelligence in the Grimstad group. He was arrested because the Germans had got hold of a telegram addressed to London that contained a reference to “Captain Tellefsen.” Wasting no time, the Gestapo arrested everybody in Grimstad with the name “Tellefsen”. 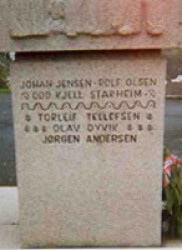 Torleif Tellefsen was one of them but he was released after a short time – only the Tellefsens with the first name Johan were held. Johan Ribe was interrogated at Kristiansand but he withstood the accompanying torture without revealing his illegal activities – and thus without compromising his colleagues. The men of Grimstad breathed more easily when he was finally sent to Oslo for internment at Grini. After the Grimstad affair, everything seemed to be going smoothly for the growing Resistance movement. In accordance with the orders in the “General Instruction”, qualified men occupied key positions in the growing structure. The need for improved communications, both internal and with London became acute, but by the end of 1942, SL in Oslo could report to London that communications in the district were satisfactory. Again the year drew to a close with no sign of an invasion. The Gestapo came for Torleif Tellefsen on January 4. After a brief spell in Kristiansand prison he was taken to join the others in “Arkivet”. We have no eye-witness account of what he endured in this infamous building. However, the Gestapo knew that the men now in their custody possessed enormous amounts of information about the Resistance movement. And we have eye-witness and survivor testimony to the terrible methods the Gestapo used to extract this information – certainly from Tellefsen also. This is not the place to dwell on these methods, it is enough to relate that formally strong and healthy men committed and tried to commit suicide, that men died from the treatment and that those who lived were often scarred for life – either physically or mentally. The torture and brutality did not work. None of the men gave away anything that could compromise the men and women who remained free. Major Laudal’s defence was total silence – not one word did he utter under interrogation – but when he realized the extent of the information already held by the Gestapo he was able to advise his fellow prisoners that they could “confess” certain aspects of their work. It was apparent, however, that the Gestapo had no knowledge of XU – the Intelligence arm of the Resistance. When the Gestapo realized that they could get no more information from the “Battle-Group 3” men, the prisoners were sent to the “Police Prison Camp” Grini, in the suburbs of Oslo. Major Laudal was in the first group on January 22, Torleif Tellefsen followed on February 15. June 10, 1943 was a black day for the Grini inmates. One hundred and fifty “Laudal’s men” were transported from Grini to concentration camps in Germany. Seventy-one ended in the “Nacht und Nebel” camp, Natzweiler. Fifty-one of them died there. The summer passed and on October 16, twelve of the leaders from Southern Norway, including Tellefsen, were relocated to the isolation cell (415) known as “Fallskjermen” (The Parachute) or “Dødens venteværelse” (Death’s waiting-room), because it was here the prisoners who were condemned, or would be condemned, to death, spent their last days. The cell, with its 4-tiered bunks housed 77 men. Major Laudal ‘s group expected to be summarily executed that evening. But the night came without incident and they settled in to the isolated life in a special atmosphere where men, though awaiting death, found comradeship, hope and compassion. In spite of the isolation there was no lack of activity in “The Parachute”. Chess and bridge were favourite pastimes. Torleif Tellefsen, with his experience from America gave English lessons and lectured on his service as a flyer in the U.S. Air Force. Major Laudal told of his posting to Germany before the war. They even formed a choir for which Tellefsen composed a special work – “Parachute Song”. Perhaps not unsurprisingly, a religious fervour flourished in this enclosed atmosphere and services were held each Sunday. At Christmas 1943 the inmates of “Fallskjermen” smuggled out a letter to the other prisoners at Grini telling them that in spite of their isolation and expected fate, they felt a peace and a power that gave them strength to face the uncertain future. They needed this strength for three more months during which time some of them, through 25X, Grini’s own Intelligence unit, had received information that their indictments had been dropped. But, on April 14, 1944, the nine leaders stood before a German Military Tribunal in a private villa previously owned by a ship-owner in Oslo. They all knew the seriousness of their situation and the strict security during their transport from Grini and the armed guards in the “court room” confirmed their views. Two benches stood in front of the judges’ table: Major Laudal, Ivar Christensen, Erik Dahl-Hansen, Olav Dyvik and Torleif Tellefsen sat on the front bench. Dr. Benestad, Arne Bjørge, and Aanund Tveit sat behind. Knut Bø, severely ill with rheumatic fever, lay on a stretcher beside the benches. After a ten-minute wait, three SS “judges” entered. With outstretched arms in Hitler salute they proclaimed: “I swear, upon my honour and conscience, to judge correctly and truly.” A civilian German “defender” was present but none of the indicted had seen him before, or spoken with him, or knew his name. The proceedings commenced – in German. A translator sat to the right of the defendants. The reading of personal details of the defendants (except Knut Bø), and the long list of serious charges against each of them was interrupted only once by Dr. Benestad who stated that his confession had been made under coercion. The judges listened but made no comment and when the indictments had been read the “court” adjourned for lunch. 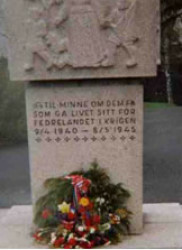 The tactic of the men’s “defence lawyer”, while not denying the seriousness of the charges, was to show them as misguided Norwegian patriots who had been infected by British propaganda. The head judge then asked each of the men if they had anything to add in their defence. Major Laudal, speaking in fluent German first confirmed his responsibility for his actions and his willingness to die for his country. He then argued that the Hague Convention had been set aside as a result of the ascension to power of Vidkun Quisling. Finally, after describing the patriotism of the men at his side, he prayed that the judges would: “…think carefully about the crimes they are charged with, in respect to their moral duty as Norwegian patriots”. Of the other defendants, only Dahl-Hansen stood up and said that their actions had been motivated by a conviction of their duty to fight for a free and independent Norway. When the head judge asked for final comments from the defendants Major Laudal again rose. He pointed out that that except for two, the defendants were grown, mature men, but that Dahl-Hansen and Christensen were only boys in comparison. He asked the court to show special consideration for these two. The court adjourned. The judges returned after half an hour. The head judge read from a typewritten document that had obviously been written before the court convened. Eight of the nine men were sentenced to death by shooting. Dr. Benestad, “for extenuating circumstances” was sentenced to eight years imprisonment. There could be no appeal but application for “pardon” could be made to Reichskommissar Terboven before April 20th. There and then, though with little hope of success, the men agreed among themselves, to apply to Terboven for pardon. The following day each man wrote a letter of appeal on paper supplied by the Germans. Each one also wrote a letter to his nearest and dearest. These personal letters were stashed in a secret hiding place in “Fallskjermen” After the war the letters were retrieved and delivered to the relatives and friends by Dr Benestad and Erik Dahl-Hansen. At about 22.30 on May 8th, a troop of German soldiers tramped into “Fallskjermen.” Two days earlier, Terboven had denied the appeals for clemency and confirmed the death sentences. Quietly and calmly the men dressed and collected their few belongings. Major Laudal and Lieutenant Tellefsen marched out first, the others followed, two by two. Once downstairs, the prisoners were placed in an empty office, a German guard gave them a packet of cigarettes and, considering the situation, the atmosphere, though quiet at first, became fairly lively. Around midnight a truck and an armoured car arrived. The prisoners, chained together sat back to back on two benches in the truck. Only Knut Bø, who had difficulty walking at all, remained un-chained. He was the last to board the truck. Later, in Trandum woods, six men faced the firing squad, quietly and unbowed. Before the last command, “fire”, a powerful voice rent the night air, Major Laudal’s final military action: “God Save our King and Fatherland”. 1. Tom was the alias of Gunvald Tomstad, a celebrated double-agent who radioed vital information to the allies and gave life-saving tips to the local resistance forces.